England finally came out on top in a penalty shootout at a World Cup as they defeated Colombia 4-3, having been held to a 1-1 draw after extra-time. It was the first time England had won a penalty shoot-out at the World Cup, and it came in dramatic fashion as Jordan Pickford produced a stunning save to deny Carlos Bacca as the momentum swung back in their favour. As seen below, the AC Milan striker saw his effort parried away after Mateus Uribe had struck the bar with England reeling after Jordan Henderson saw his effort saved. All that meant that it came down to Eric Dier to score his penalty to win it for England, and he did so as he squeezed his effort past David Ospina. England deserved to win the game on the balance of play as they made the brighter start, and created the better opportunities through the course of the encounter. 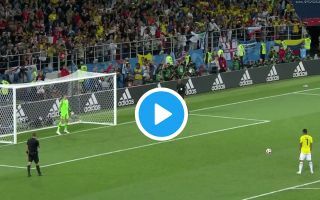 Harry Kane broke the deadlock from the spot, but an injury-time equaliser from Yerry Mina kept Colombia alive as they searched for a winner in extra-time. It didn’t come, and England went on to finally enjoy success in a penalty shoot-out to set up a quarter-final clash with Sweden later this week. Things have undoubtedly opened up on the right side of the World Cup draw with Croatia facing Denmark in the other quarter-final, and so Gareth Southgate’s men will be growing in confidence and will hope that they can continue their journey in Russia as this will be a big moment for them.